Welcome to MyASPCA.org! Thank you for watching our TV Commercial and for taking action on behalf of the animals we serve, just like the ones you saw on television. The ASPCA works all year long to rescue animals, but we cannot do it without your help. The ASPCA Guardian monthly giving program is the best way to help animals in need. 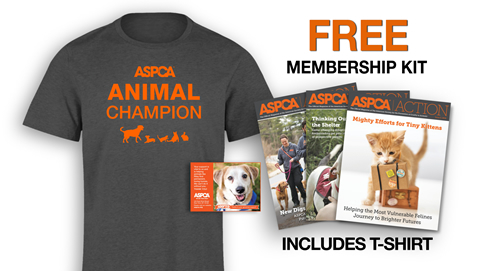 As a Guardian you’ll receive a limited-edition Animal Champion ASPCA t-shirt and a photograph of an ASPCA rescued animal. In addition you will receive a biannual statement and newsletter. Yes, please include a t-shirt in my membership kit. For your convenience we have put together some of the most commonly asked questions below about how our program works. Of course, if you have a question not covered here, or prefer to make your gift over the phone, please feel free to call (800) 291-8028. Q: Once I've made an online gift, how can I make changes to my account i.e. change amount, change my credit card number? *Please allow 4 - 6 weeks for delivery of your t-shirt & materials. T-shirts are available in size extra large only.